PFLUGERVILLE, TX (March 27, 2019)— Our CCHS Pride of Cove Color Guard team brought home a second place trophy from the Texas Color Guard Circuit Area Competition at Hendrickson High School on Saturday. Their placement in the top four scores in their classification of Scholastic A qualified the Copperas Cove High School students to compete at the TCGC State Championships tomorrow at Reed Arena on the Texas A&M campus at College Station. The Pride of Cove Winter Guard 2019 show, Madness, features a floor mat covered in random definitions of the word, madness. Sitting atop the mat are benches that performers utilize to execute difficult rifle and flag tosses and spins. Following the theme of “Madness,” the performers use rifles, sabers, and flags, to convey the imagery of isolation, confusion, and angst. 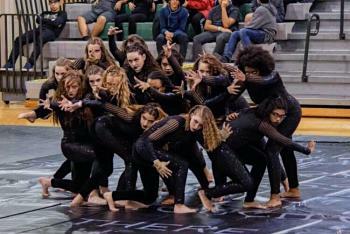 The show was designed and choreographed by CCHS Color Guard Directors Nancy Norris and Samantha Manuel, Instructor Chrissa Link and students. The CCHS Color Guard team competed at five regional TCGC competitions, taking home two first place and three second place trophies during the season. For high school seniors include Mackenzie Callison who is one of the team captains will wrap up her high school career at Saturday’s competition. The Pride of Cove Color Guard will perform at the TCGC State Championships at 12:18 p.m. on Saturday at Reed Arena, Texas A&M University, College Station. More information is available at https://www.texascolorguardcircuit.org/events/17364.